Americans are regularly told that they live in a great majoritarian democracy. The reality of American political life is very different. As the distinguished political scientists Benjamin Page (Northwestern) and Marin Gilens (Princeton) show in their important new volume Democracy in America? Mammon reigns in the United States, where “government policy . . . reflects the wishes of those with money, not the wishes of the millions of ordinary citizens who turn out every two years to choose among the preapproved, money-vetted candidates for federal office” (emphasis added). Thanks to this “oligarchy,” as Page and Gilens call it, the United States ranks at or near the bottom of the list of rich nations when it comes to key measures of social health: economic disparity, intergenerational social mobility, racial inequality, racial segregation, infant mortality, poverty, child poverty, life expectancy, violence, incarceration, depression, literacy/numeracy, and environmental sustainability and resilience. Economic globalization and labor-displacing technology are part of what plagues the U.S., Page and Gilens note, but “all other advanced countries have faced [those] same pressures” and “nearly all of them have done much better than we have at” limiting inequality.” Those countries have used “a range of egalitarian public policies to spread the gains from trade and technology more widely, allowing many more of their citizens to benefit.” Plutocracy negates such policies in the U.S.
It’s a vicious circle. As Page and Gilens note, “When citizens are relatively equal [economically], politics has tended to fairly democratic. When a few individuals hold enormous amounts of wealth, democracy suffers.” Savage inequality and abject plutocracy are two sides of the same class-rule coin in New Gilded Age America, as in previous eras. Democracy in America? shows that majority progressive public opinion is regularly trumped by a deadly complex of forces in the U.S. The list of interrelated and mutually reinforcing culprits they examine is extensive: the campaign finance, candidate-selection, lobbying, and policy agenda-setting power of wealthy individuals, corporations, and interest groups; the special primary election influence of extreme party activists; the disproportionately affluent, white, and older composition of the active (voting) electorate; the manipulation of voter turnout; the widespread dissemination of “distracting, confusing, misleading, and just plain false information;” unrepresentative political institutions (the Electoral College, the unelected Supreme Court, the over-representation of the predominantly white rural population in the U.S. Senate, and “one-party rule in the House of Representatives”); constitutional and related partisan government gridlock and the fragmentation of authority in government. Page and Gilens break down the dismal, dollar-drenched democratic dysfunction of the American political system across four chapters that detail how wealth disparity combines with political and governmental gridlock to thwart ordinary Americans’ progressive policy wishes (chapter 3); how the wealthy Few exercise wildly disproportionate influence on politics and policy as compared to the tiny clout of mass-based citizens’ groups (chapters 4 and 5); and how major party polarization and gridlock negate the people’s will at numerous “veto points” across the system (chapter 6). The book’s next three chapters propose solutions, calling for critical political reforms and a “large-long-term social movement for Democracy.” Such a movement must pursue increased equality, since plutocracy grows atop extreme economic disparity like white on rice. The book’s final chapter sees hopeful signs, drawing lessons and inspirations from democratic reforms already underway at the state and local levels. Also deleted is the American workplace. As the radical economist Richard Wolff likes to remind us, ordinary working-class and working-age Americans spend most of their waking lives on the job, under the authoritarian and often despotic supervision of employers. Until its workers own, direct, and structure their own workplaces as “associated producers,” democratically determining the purpose and nature of their productive activities and appropriating the surplus generated for themselves and the broader common good, it is difficult to think of a society as meaningfully democratic. Capitalism and democracy have long stood in fundamental opposition to one another—a problem that does not engage Page and Gilens. 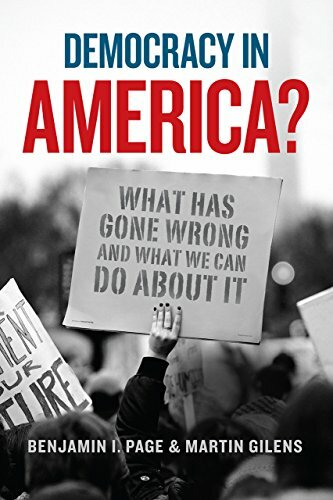 Still, their new volume is a brilliant, indispensable, and highly accessible (suitable for a public as well as an academic audience) examination of the inner undemocratic workings of a U.S. political system that is regularly and incorrectly held up as an unmatched model of popular self-rule.